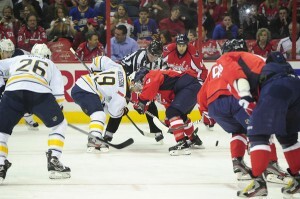 Few would have predicted late March’s game between the Buffalo Sabres and Washington Capitals to feature playoff implications, but with the Caps and Sabres tied with 84 points before their Mar. 26 date, it sure would be one to watch. While the Sabres have gotten hot recently, fighting their way back into the race after a first half to forget and winning four in a row, the issue for Washington is that with exception to the Toronto Maple Leafs, they haven’t been able to put away teams that are close to them in the standings in the most crucial of times. Their saving grace, though, is that lately, outside of those games, they’ve stumbled onto wins against other teams. For instance, the Caps may have shut out the Minnesota Wild Sunday afternoon, 3-0, but in the previous game, they failed to put away the Winnipeg Jets, who ended up just four points behind Washington after they defeated the home Capitals, 4-3, in overtime. The Caps had a 3-0 lead at one point, but the Jets have had their number this season, and completed their comeback. Winnipeg shot itself in the foot with their own losses to Ottawa and Carolina, but a team like the Sabres has shown an ability to keep winning, thanks to Ryan Miller, who was named NHL’s Second Star of the Week honors for last week, had a 1.26 goals-against average and a .956 save percentage during the four-game win streak. 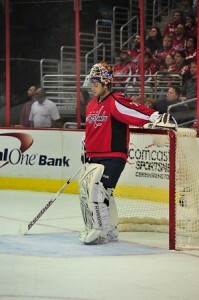 Tuesday night, destiny no longer remains in the Capitals’ hands, as the home team lost, 5-1, to Buffalo. Prior to the game, the Caps sat in eighth place, but now are in ninth after the loss to the Sabres. After several miscues that Buffalo took advantage of, coupled with the failed conversions on scoring chances for Washington, the win was rather easy for the “underdogs” to take. “It hasn’t been much different for the past two months so there’s no sense changing now,” said Miller. “It’s a stop along the way. It’s a big hype game but it’s the same game [that we’ve needed to win for a while]. It certainly didn’t help that even though the Caps made it a 3-1 game, there was not much change in their game — not even a fight from Matt Hendricks to spark things and show the Sabres the game wasn’t over. Instead, soft passes and poor shot quality, resulting in one goal on 40 shots continued the rest of the match. The race is still on with now five games left in the season, and by no means is it all over, as Knuble stated. The Caps are now only back by one, and just like Buffalo came back, the Caps can do the same. However, if they weren’t able to answer in this game, or other games where it was a supposed “playoff atmosphere, with this many flaws, how many more games will they need to answer the bell to before it is all over? They’ll have Thursday’s game on the road against the Boston Bruins to find out.